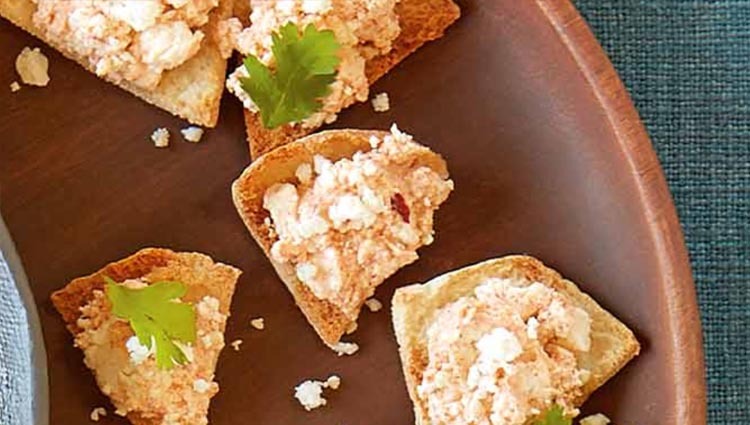 Spicy harissa sauce and tangy feta cheese are a marvelous match. Don't omit the cilantro garnish--it lends a bright, refreshing taste element. Recipe and photo ©Wisconsin Milk Marketing Board. In medium bowl, combine yogurt, harissa sauce and lemon juice; mix well. Stir in feta cheese. Cover and refrigerate at least 1 hour. Spread cheese mixture on chips and top each with cilantro leaf.